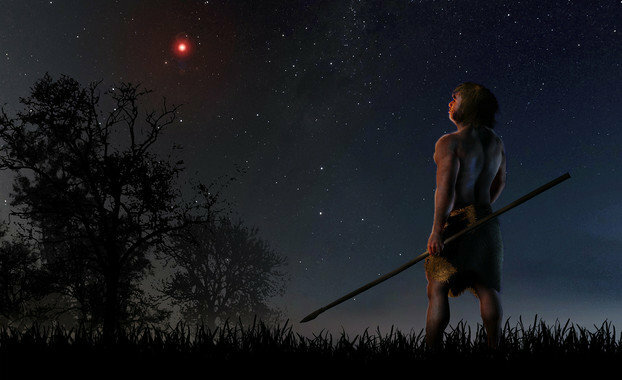 The red dwarf star came closer than 1 light-year to the sun 70,000 years ago. Some distant objects in our solar system bear the gravitational imprint of a small star's close flyby 70,000 years ago, when modern humans were already walking the Earth, a new study suggests. In 2015, a team of researchers announced that a red dwarf called Scholz's star apparently grazed the solar system 70,000 years ago, coming closer than 1 light-year to the sun. For perspective, the sun's nearest stellar neighbor these days, Proxima Centauri, lies about 4.2 light-years away. The astronomers came to this conclusion by measuring the motion and velocity of Scholz's star — which zooms through space with a smaller companion, a brown dwarf or "failed star" — and extrapolating backward in time. The new study bolsters the 2015 analysis with a different type of evidence. A research team led by Carlos de la Fuente Marcos, of the Complutense University of Madrid, analyzed 339 known solar system bodies with hyperbolic orbits — paths through space that are V-shaped, rather than circular or elliptical. Objects on hyperbolic orbits could theoretically have come from interstellar space, just like 'Oumuamua, the first known solar system visitor born around another star. But they could also be natives nudged onto weird tracks by gravitational interactions with the sun or some of its planets. And denizens of the Oort Cloud — a frigid ring far from the sun that's home to trillions of comets — could even be "perturbed" by the Milky Way's disk, or wandering stars that get too close. "Using numerical simulations, we have calculated the radiants or positions in the sky from which all these hyperbolic objects seem to come," de la Fuente Marcos said in a statement. "In principle, one would expect those positions to be evenly distributed in the sky, particularly if these objects come from the Oort Cloud," he added. "However, what we find is very different: a statistically significant accumulation of radiants. The pronounced over-density appears projected in the direction of the constellation of Gemini, which fits the close encounter with Scholz's star." 'Oumuamua is not among the Gemini group, so that bizarre, needle-shaped object really does seem to have come from another star system, the researchers added. They also flagged eight other bodies that may be interstellar interlopers, including Comet ISON, which broke apart during a highly anticipated close pass by the sun in November 2013. The new study was published online last month in the journal Monthly Notices of the Royal Astronomical Society: Letters. You can read it for free at the online preprint site arXiv.org.